I love to cook and enjoy trying new recipes. I had intended to start with Lyndsay Faye’s The Gods of Gotham, but I have not decided what to make yet, so I will have to get back to that. 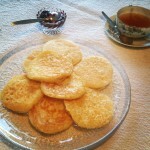 Instead I decided to try English crumpets, which I made with my mom during Easter. Two for Sorrow is Nicola Upson’s third historical crime novel about the British author Josephine Tey. Josephine is a real person, but she wrote using a pen name. Her real name was Elizabeth MacKintosh and she lived in the first half of the 1900s. The novels take place in the 1930s. In this novel Josephine investigates a spectacular murder case from the early 1900s where two women were convicted of infant murder and then hanged. The case turns out to be connected to a scary murder case in the sewing workshop owned by one of Josephine’s good friends. I really like historical crime novels, especially when the author succeeds in transporting the reader to a different time period and you get an understanding and feeling for how it was during that time. In this novel we get to know life both at the top and bottom of the British society. We get to go to a women’s’ prison as well as glitzy theatres and preparations for a charity event. In the novel Josephine visits the English coastal town Walberswick in Suffolk, near Ipswich, where she orders crumpets. The Old Cottage Tearooms occupied a pretty, single-story white building opposite the village green. The beams and floorboards were ingrained with centuries of living and, as she took a table next to the fireplace, she relished the smell of home cooking. which filled the room. A bell over the door had rung when she walked in, and she sensed the proprietor hovering behind the kitchen door. ”What can I get you Madam?” she asked, stoking up the fire. 1. Heat milk and water to 45 degrees C.
2. Mix flour, yeast and salt in a bowl. 3. Add the milk/water and mix together. It is supposed to be thicker than pancake batter. 4. Let rise for 45 minutes. 5. Heat a frying pan and add lots of butter. 6. 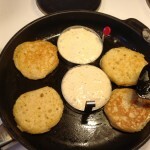 Add crumpet batter (this recipe makes 8 crumpets) and brown on both sides (about 2 min/side). 7. Serve immediately with butter and jam/cheese and tea. 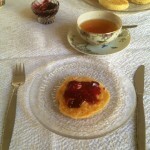 My mom had homemade red currant jam at home which we served with the crumpets, and we also found grandma’s old tea set, which was very fitting!